Bhopal: The much awaited hearing in the case linked with reservation in promotions in Madhya Pradesh Government departments for those belonging to the Scheduled Castes and Scheduled Tribes will come up for hearing in the Supreme Court on 8 November. The hearing in this case stood adjourned in the second fortnight of September. When the ruling BJP in Madhya Pradesh is locked in the crucial parliamentary by-election for the Shahdol seat, this appeal which has gone viral on social networking sites, has the potential to swing a large number of votes away from the ruling party. Even as the matter is being adjudicated at the apex court level, those belonging to the General category, other backward communities and the minorities, who are suffering due to the reservation policy of the State BJP Government have rallied their forces under the banner of “SAPAKS Samaj” (Samanya, Pichda, Alpsankhyak Kalyan Samaj). 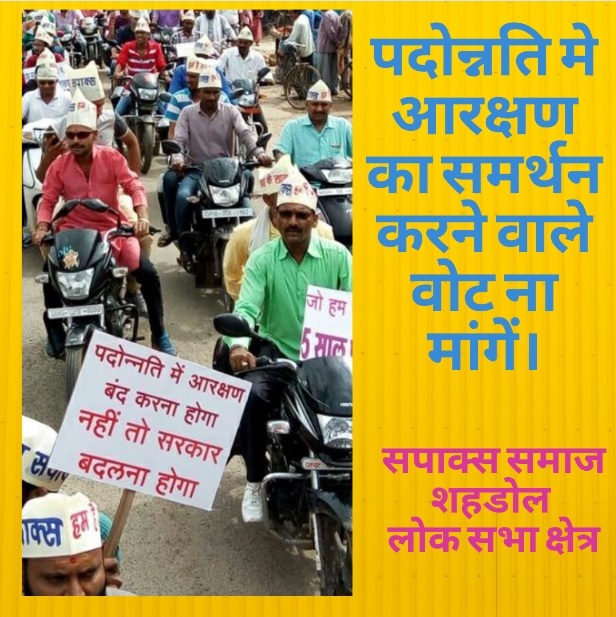 A SAPAKS spokesperson told newsroom24x7 today that the SAPAKS samaj has appealed to the voters in the Shahdol Parliamentary constituency and Nepanagar Assembly contituency not to vote for those who support reservation in promotions during the ongoing by-elections. A SAPAKS volunteer in Shahdol said that the outcome in Shahdol could go against the ruling BJP as the SAPAKs samaj can sway a large percentage of votes in the by-election. The reservation in promotion case was listed for hearing in Supreme Court for 21 and 22 September this year but it did not come up for hearing as per the weekly schedule as all matters listed before the concerned Bench stood adjourned. A Supreme Court notice on September 22 had said that due to the non-availability of Mr. Justice J. Chelameswar, the matters shown in the Daily List of Regular and Miscellaneous matters in court No. 5 before the Bench comprising Mr. Justice J. Chelameswar and Mr. Justice Abhay Manohar Sapre stood adjourned. Madhya Pradesh Government has filed the appeal in Supreme Court against the High Court order that struck down the State Government provision for reservation in promotions in government departments for those belonging to the Scheduled Caste and Schedules Tribe (SC/ST) category. Earlier on 30 April, a two Judge Bench of the High Court of Madhya Pradesh gave a landmark judgment on the issue of reservation in promotions (in government service) for the SC/ST category by declaring as ultra vires and non-est in law the existing provision relating to reservation, backlog, vacancies, carry forward of backlog vacancies and the operation of roster, contained in the Madhya Pradesh Rules of 2002. The High Court said in its order that the provision for reservation for promotions granted to the SC/ST category under Madhya pradesh Rules 2002 runs contrary to the constitutional provisions contained in clause (4A) and (4B) of Article 16 and Article 335 of the Constitution. The Madhya Pradesh Rules with provision for reservation in promotions for SC/ST category were framed and brought in force by the previous Madhya Pradesh Congress Government led by Digvihay Singh. The order passed on 30 April by the High Court bench, comprising of Chief Justice AM Khanwilkar and Justice Sanjay Yadav, categorically stated that various promotions of SCs/STs category made on the basis of the Rules of 2002 are held to be nonest in the eyes of law and the persons be placed in the position as if the said Rules (i.e. the Rules which are declared ultra vires) never existed and all actions taken in furtherance thereof must be reverted to status quo ante. The Madhya Pradesh Rules of 2002, were brought in vogue in exercise of the powers conferred by the proviso to Article 309 read with Article 16 and 335 of the Constitution of India, which relates to determination of the basis for promotion in public services and posts and also, the reservation in promotion in favour of Scheduled Castes and Scheduled Tribes. The High Court order of 30 April this year, which has been challenged by the Madhya Pradesh Government in Supreme Court came in response to a number of petitions filed in the court by those belonging to the general, OBC and minority categories who challenged Madhya Pradesh Rules of 2002 that carry the provision for reservation, backlog, vacancies, carry forward of backlog vacancies and the operation of roster in favour of the SC/S categories. Prior to that the Indore bench of the High Court had stayed all promotions while hearing a petition regarding injustice in promotions in the State Public Health Engneering department due to the reservation policy of the State Government. After that all related petitions were compiled and the hearing in this case began in Jabalpur High Court, which later passed the order to declare as ultra vires and non-est in law the provision relating to reservation. The State Government which has been bent upon continuing reservation in promotions for the SC/ST categories went in appeal to the Supreme Court.